Provide comfort for the family of James Thomas with a meaningful gesture of sympathy. 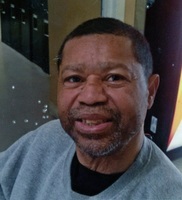 Mr. James “Jimbo” Thomas, Jr. 68, passed on February 5, 2019 at St. Francis Hospital Downtown. He was a son of the late James Thomas and Dorothy Dunn. Surviving are two daughters, Nisha (Aaron) Gordon of Simpsonville, SC and Brittney Thomas of Phoenix, AZ; one son, Brandon Thomas of Phoenix AZ; one sister, Viola (Oliver) Dunn of Plaquemine, LA; ten foster sisters, Gwen (Russell) Polar, Eloise Wells, Audrey (Andrew) Burns, Eula (Charles) Smith, Ella (Robert) Davis, Gloria Alexander, Rita Reynolds, Lela (Pat) Brady, Marie Brown and Eva Turner, all of Louisiana; three brothers,Jessie (Lisa) Tate, Sr., John Henry Johnson, Charlie Tate, all of Louisiana; one foster brother, William (Mary) Vercher of Louisiana; eight grandchildren; and a host of other relatives and friends.